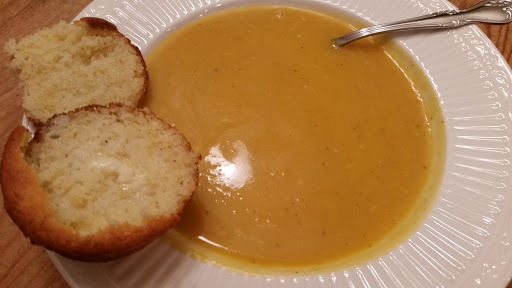 I’ll admit, squash of any kind is not my family’s favorite, but this soup was really delicious. Begin by cutting 2 medium sized butternut squash in half length-wise. I tried and failed before asking the Mr to do it for me. Place on a baking sheet lined with foil, drizzle with olive oil, salt and pepper, and bake at 350 degrees until tender, 55-60 minutes. After the squash has cooled, scoop the meat from the shells and set aside. 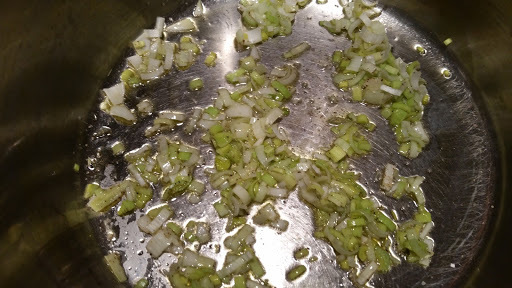 In a large pot, saute 1/4 cup leeks in olive oil until tender and translucent. Add the squash, 28 oz. of chicken broth, 1/4 teaspoon nutmeg, and 1/2 teaspoon of ground sage. If you have fresh sage that is great. Let simmer for 10 minutes then use an immersion blender to blend all the ingredients. Add 1/4 cup half and half (or heavy cream) and stir until blended. Salt and pepper to taste. Serve with cornbread muffins and enjoy! If there was anything I would do differently, I might not blend as much to leave the soup a little chunkier, but it was delicious just like this.